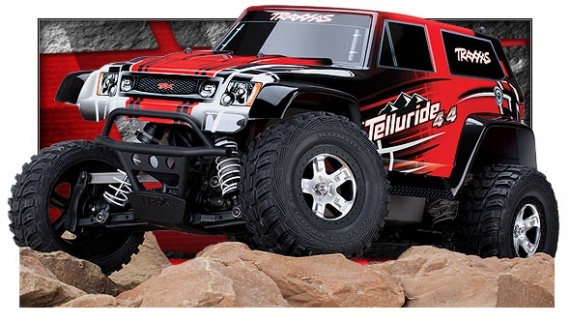 New Telluride 4X4 Extreme Terrain 4WD Trail Rig! The NEW Traxxas Telluride Extreme Terrain 4X4 Trail Rig — engineered to go places in the farthest reaches of your imagination. Four-wheel-drive traction, specially tuned differentials, and long-arm suspension give it sure-footed rock-crawling prowess for thrilling off-road adventures. Off the rocks, powerful Traxxas electronics dish out high-speed driving excitement. It’s all waterproof, so the fun keeps going through water crossings, mud, and even new mountain snow!